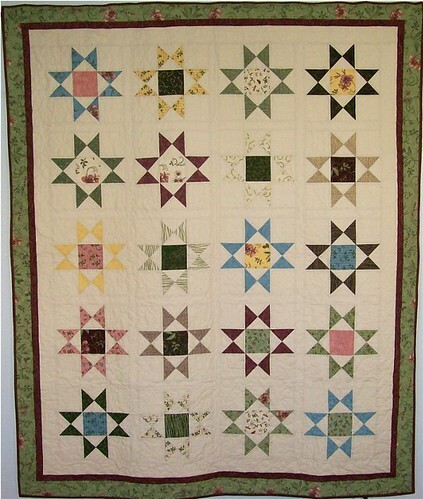 The Everything Old Is New Again quilt is finished and the pattern is available in my Etsy shop. Actually, it’s been finished for almost a week, but I finally finished the pattern this morning. Why, oh why did I think the pieced border was a good idea?! It is easy to sew and adds a nice little bit of interest, but it’s a real pain to calculate in five different quilt sizes. See, my patterns include directions for different size quilts, and the spacing of the white squares in this border is different for each size. It took me longer to figure out and write the instructions for the outer border than for the entire rest of the quilt. This makes ONE quilt finished for the Spring to Finish list! Woohoo! They are both so absolutely beautiful. You make wonderful patterns. 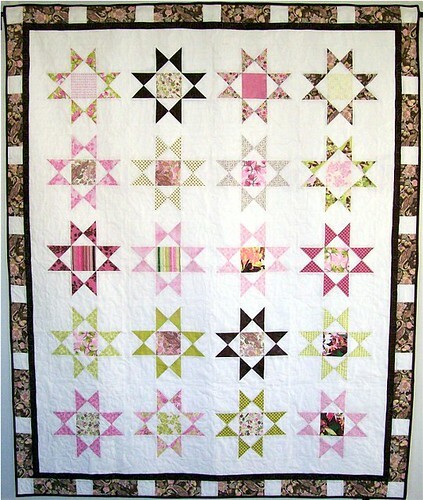 I am soooo hokked on stars at the moment and love the pinks and green together!